Nanomaterials expert and Department of Aerospace Engineering alum, Dr. Nikhil Koratkar (M.S. '98; Ph.D. '00) was awarded the 2009 SES Young Investigator Award from the Electrochemical Society (ECS) Division of Fullerenes, Carbon Nanotubes and Nanostructures. Koratkar is currently a professor of mechanical, aerospace, and nuclear engineering at Rensselaer Polytechnic Institute (RPI). As part of the award, Koratkar will receive $500 and deliver a special presentation in April 2010 at the ECS annual meeting in Vancouver, Canada. The annual award, presented by Dr. Toh-Ming Lu, the Ray Palmer Baker Distinguished Professor of Physics and director of the Center for Advanced Interconnect Systems Technologies at Rensselaer announced on November 7, 2009, is reserved for ?one outstanding young researcher? and aims to ?encourage especially promising researchers to remain active in the field [of anotechnology]. Dr. Toh-Ming Lu stated, "he has made remarkable contributions in interdisciplinary science and engineering in the area of carbon nanostructures, which led to this great honor and award.? 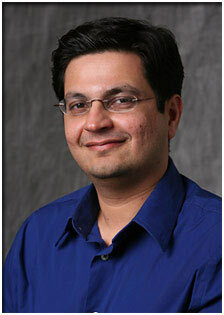 Koratkar joined the Rensselaer faculty in 2001, and was named a full professor in 2009. His research interests are focused on the synthesis of a variety of nanomaterials including carbon nanotubes, graphene, as well as metal- and silicon-based nanostructures. He is the author of more than 60 archival journal publications and book chapters He is currently an associate editor of the journal Nanoscience and Nanotechnology Letters and an associate fellow of the American Institute for Aeronautics and Astronautics (AIAA). Koratkar received his bachelor?s degree from the Indian Institute of Technology. ?He has made remarkable contributions in interdisciplinary science and engineering in the area of carbon nanostructures, which led to this great honor and award. ?